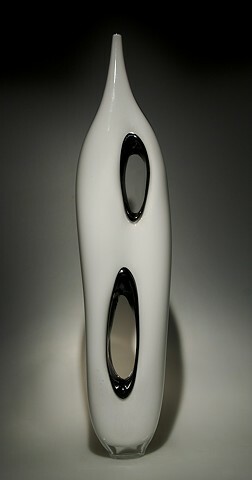 Sculptural White Fantasmo Bottle. The holes were done by drilling the glass with a specialized metal while the glass is still on the pipe and around 1800 degrees. The black outline is achieved by adding Black Opal hot glass while making holes larger and larger. Fantasmo Bottles are made as one of a kind pieces, custom pieces can be ordered in the Fantasmo style.